Something I never thought I would see: The editorial board of one of the most important newspapers in the United States has published two separate editorials, one endorsing an increase in the size of the House of Representatives (suggesting 593 seats) and another endorsing the single transferable vote (STV) form of proportional representation for the House. It is very exciting that the New York Times has printed these editorials promoting significant institutional reforms that would vastly improve the representativeness of the US House of Representatives. The first is an idea originally proposed around 50 years ago by my graduate mentor and frequent coauthor, Rein Taagepera, based on his scientific research that resulted in the cube root law of assembly size. The NYT applies this rather oddly to both chambers, then subtracts 100 from the cube root result. But this is not something I will quibble with. Even an increase to 550 or 500 would be well worth doing, while going to almost 700 is likely too much, the cube root notwithstanding. The second idea goes back to the 19th century (see Thomas Hare and Henry R. Droop) but is as fresh and valid an idea today as it was then. The NYT refers to it as “ranked choice voting in multimember districts” and I have no problem whatsoever with that branding. In fact, I think it is smart. Both ideas could be adopted separately, but reinforce each other if done jointly. They are not radical reforms, and they are not partisan reforms (even though we all know that one party will resist them tooth and nail and the other isn’t exactly going to jump on them any time soon). They are sensible reforms that would bring US democracy into the 21st century, or at least into the 20th. It is good to see the undersized nature of the US House of Representatives get attention in the New York Times‘s Economix blog. The author is Bruce Bartlett, who “held senior policy roles in the Reagan and George H.W. Bush administrations and served on the staffs of Representatives Jack Kemp and Ron Paul”. according to the Inter-Parliamentary Union, the House of Representatives is on the very high side of population per representative at 729,000. 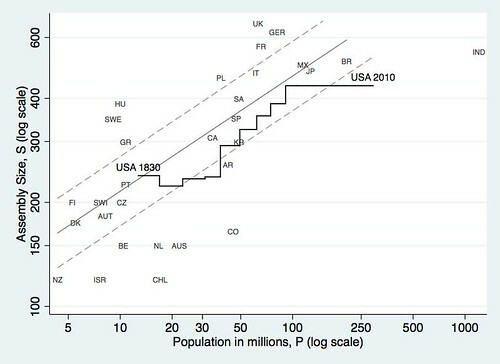 The population per member in the lower house of other major countries is considerably smaller: Britain and Italy, 97,000; Canada and France, 114,000; Germany, 135,000; Australia, 147,000; and Japan, 265,000. Note the flat line for the USA, indicating lack of increase in House size, since the population was less than a third what it is today. This recent static period is in contrast to earlier times, depicted by the zig-zag black line, in which the USA regularly adjusted House size, keeping it reasonably close to the cube-root expectation. As expected, the mean ratio for the thirty-one countries is very close to one (0.992, with a standard deviation of .37). The five most oversized, all greater than 1.4, are France, Germany, UK (at 1.67), Sweden, and Hungary. (The latter was at a whopping 1.80, but has since sharply reduced its assembly size.) Spain, Denmark, Switzerland, Portugal, and Mexico all get the cube root prize for having assembly sizes from .975 to 1.03 of the expectation. After the first enumeration required by the first article of the Constitution, there shall be one representative for every 30,000, until the number shall amount to 100, after which the proportion shall be so regulated by Congress, that there shall be not less than 100 representatives, nor less than one representative for every 40,000 persons, until the number of representatives shall amount to 200; after which the proportion shall be so regulated by Congress, that there shall not be less than 200 representatives, nor more than one representative for every 50,000 persons. Obviously, Madison’s formula would have run into some excessive size issues over time. And Bartlett does not suggest how much the House should be increased, only noting that its ratio of one Representative for very 729,000 people is excessive. On the other hand, Madison’s ratio of one per 50,000 would produce an absurdly large House! It is just the need to balance the citizen-representative ratio with the need for representatives to be able to communicate effectively with one another that Taagepera devised the model of the cube root, which as we have seen, fits actual legislatures very well. The cube root rule says the USA “should have” a House of around 660 members today, which would remain a workable size. (If the USA and UK swapped houses, each would be at just about the “right” size!) Even an increase to just 530 would put it within about 80% of the cube root. As Bartlett notes, at some point the US House will be in violation of the principle of one person, one vote (due to the mandatory representative for each state, no matter how small). However, a case filed in 2009 went nowhere. * Each country is plotted according to its population, P (in millions), and the size, S, of its assembly. In addition, the size of the US House is plotted against US population at each decennial census from 1830 to 2010. The solid diagonal line corresponds to the “cube root rule”: S=P^(1/3). The dashed lines correspond to the cube root of twice or half the actual population, i.e. S=(2P)^(1/3) and S=(.5P)^(1/3). A variant of the graph will be included in Steven L. Taylor, Matthew S. Shugart, Arend Lijphart, and Bernard Grofman, A Different Democracy (Yale University Press). An even earlier version of the graph was posted here at F&V in 2005. David Fredosso, writing at Conservative Intelligence Briefing, makes the case for increasing the size of the US House, citing one of my previous posts advocating the same. He makes two additional and valuable points: (1) “The Wyoming Rule”, by which the standard Representative-to-population ratio would be that of the smallest entitled unit, is misleading as to how representation is currently (mal-)apportioned; (2) Increasing the size of the House would not, as is sometimes assumed, be of benefit to Democrats and liberals. David quibbles with the Wyoming part of the story, noting that “Wyoming is not the most overrepresented state — by a long way, that distinction goes to Rhode Island, with its two districts, average population 528,000”, whereas Wyoming has a population of 568,000 (and one seat). I would note that this is a very small quibble indeed, as the Wyoming Rule–which, to be fair, I neither named nor invented–refers to “smallest entitled unit” not to “most over-represented unit”. Of course, every state is a unit entitled to at least one, but sometimes a state with two members indeed will be over-represented to a greater degree than some state with one member. Whichever we base it on–smallest entitled or most over-represented–the principle is the same: expand the House. David proposes a House of 535, and has a table of how that would change each state’s current representation. I would go higher (600 or so), but the precise degree of increase is an even smaller quibble. I am pleased to see this idea being promoted in conservative (or liberal, or whatever) circles. And it’s always nice to be cited. Reapportionment–a better way? ; this includes a discussion of the cube-root rule of assembly size, and a graph of how the US relationship of House size to population compares to that of several other countries, and how it has changed over time as the US population has grown, but the House stopped doing so. In the week since the US elections, several sources have suggested that there was a spurious majority in the House, with the Democratic Party winning a majority–or more likely, a plurality–of the votes, despite the Republican Party having held its majority of the seats. It is not the first time there has been a spurious majority in the US House, but it is quite likely that this one is getting more attention ((For instance, Think Progress.)) than those in the past, presumably because of the greater salience now of national partisan identities. Ballot Access News lists three other cases over the past 100 years: 1914, 1942, and 1952. Sources disagree, but there may have been one other between 1952 and 2012. Data I compiled some years ago showed a spurious majority in 1996, if we go by The Clerk of the House. However, if we go by the Federal Election Commission, we had one in 2000, but not in 1996. And I understand that Vital Statistics on Congress shows no such event in either 1996 or 2000. A post at The Monkey Cage cites political scientist Matthew Green as including 1996 (but not 2000) among the cases. Normally, in democracies, we more or less know how many votes each party gets. In fact, it’s all over the news media on election night and thereafter. But the USA is different. “Exceptional,” some say. In any case, I am going to go with the figure of five spurious majorities in the past century: 1914, 1942, 1952, 2012, plus 1996 (and we will assume 2000 was not one). How does the rate of five (or, if you like, four) spurious majorities in 50 elections compare with the wider world of plurality elections? I certainly do not claim to have the universe of plurality elections at my fingertips. However, I did collect a dataset of 210 plurality elections–not including the USA–for a book chapter some years ago, ((Matthew Soberg Shugart, “Inherent and Contingent Factors in Reform Initiation in Plurality Systems,” in To Keep or Change First Past the Post, ed. By André Blais. Oxford: Oxford University Press, 2008.)) so we have a good basis of comparison. Out of 210 elections, there are 10 cases of the second party in votes winning a majority of seats. There are another 9 cases of reversals of the leading parties, but where no one won over 50% of seats. So reversals leading to spurious majority are 4.8% of all these elections; including minority situations reversals are 9%. The US rate would be 10%, apparently. But in theory, a reversal should be much less common with only two parties of any significance. Sure enough: the mean effective number (N) of seat-winning parties in the spurious majorities in my data is just under 2.5, with only one under 2.2 (Belize, 1993, N=2.003, in case you were wondering). So the incidence in the US is indeed high–given that N by seats has never been higher than 2.08 in US elections since 1914, ((The original version of this statement, that “N is almost never more than 2.2 here” rather exaggerated House fragmentation!)) and that even without this N restriction, the rate of spurious majorities in the US is still higher than in my dataset overall. I might also note that a spurious majority should be rare with large assembly size (S). While the US assembly is small for the country’s population–well below what the cube-root law would suggest–it is still large in absolute sense. Indeed, no spurious majority in my dataset of national and subnational elections from parliamentary systems has happened with S>125! However, one does not need gerrymandering to get a spurious majority. As political scientists Jowei Chen and Jonathan Rodden have pointed out (PDF), there can be an “unintentional gerrymander,” too, which results when one party has its votes less optimally distributed than the other. The plurality system, in single-seat districts, does not tote up party votes and then allocate seats in the aggregate. It only matters in how many of those districts you had the lead–of at least one vote. Thus a party that runs up big margins in some of its districts will tend to augment its total in its “votes” column at a faster rate than it augments its total in the “seats” column. This is quite likely the problem Democrats face, which would have contributed to its losing the seat majority despite its (apparent) plurality of the votes. 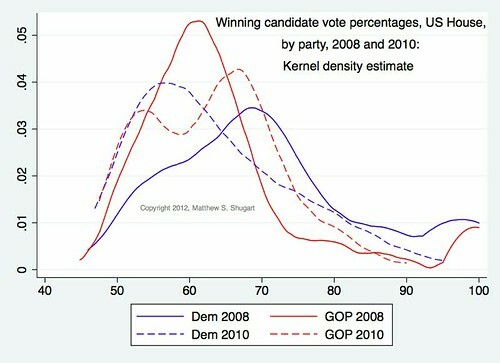 Consider the following graph, which shows the distribution (via kernel densities) of vote percentages for the winning candidates of each major party in 2008 and 2010. We see that in the 2008 concurrent election, the Democrats (solid blue curve) have a very long and higher tail of the distribution in the 70%-100% range. In other words, compared to Republicans the same year, they had more districts in which they “wasted” votes by accumulating many more in the district than needed to win it. Republicans, by contrast, tended that year to win more of their races by relatively tighter margins–though their peak is still around 60%, not 50%. I want to stress, the point here is not to suggest that 2008 saw a spurious majority. It did not. Rather, the point is that even in a year when Democrats won both the vote plurality and seat majority, they had a less-than optimal distribution, in the sense of being more likely to win by big margins than were Republicans. I look forward to producing a similar graph for the 2012 winners’ distribution, but will await more complete results. A lot of ballots remain to be counted and certified. The completed count is not likely to reverse the Democrats’ plurality of the vote, however. Given higher Democratic turnout in the concurrent election of 2012 than in the 2010 midterm election, it is likely that the distributions will look more like 2008 than like 2010, except with the Republicans retaining enough of those relatively close wins to have held on to their seat majority. Finally, a pet peeve, and a plea to my fellow political scientists: Let’s not pretend there are only two parties in America. Since 1990, it has become uncommon, actually, for one party to win more than half the House votes. Yet my colleagues who study US elections and Congress continue to speak of “majority”, by which they mean more than half the mythical “two-party vote”. In fact, in 1992 and every election from 1996 through at least 2004, neither major party won 50% of the House votes. I have not ever aggregated the 2006 vote. In 2008, Democrats won 54.2% of the House vote, Republicans 43.1%, and “others” 2.7%. I am not sure about 2010 or 2012. It is striking, however, that the last election of the Democratic House majority and all the 1995-2007 period of Republican majorities, except for the first election in that sequence (1994), saw third-party or independent votes high enough that neither party was winning half the votes. Assuming spurious majorities are not a “good” thing, what could we do about it? Democrats, if they are developing a systematic tendency to be victims of the “unintentional gerrymander”, would have an objective interest in some sort of proportional representation system–perhaps even as much as that unrepresented “other” vote would have. The number of members in the Lower House should remain at 150. Is the size of the chamber an issue in the Netherlands? For the record, the chamber is one of the most undersized among the major democracies (see graph), according to the cube-root rule. On a somewhat related note, can anyone explain the Central Planning Agency, mentioned in a Monkey Cage post as an “authoritative” institution that “runs each party’s submissions [i.e. campaign proposals] through a model and offers projections”? Voters in Puerto Rico go to the polls next Sunday, August 19, 2012, to cast ballots in a constitutional amendments referendum, concerning the Legislative Assembly’s number of members and the right to bail. The constitutional amendment on the Legislative Assembly’s number of members proposes a reduction of the number of senators from 27 to 17, and the number of representatives from 51 to 39, starting in 2016. The number of Senate districts would be increased from eight to eleven, but each Senate district would elect one senator, instead of two. In addition, each Senate district would include three House of Representatives districts (instead of five), for a total of 33 House districts; each House district would continue to elect one representative. Moreover, the number of at-large seats in each House would be reduced from eleven to six. Likewise, the minority party representation cap would be reduced from nine to six seats in the Senate, and from 17 to 13 seats in the House of Representatives. If we go by the cube-root rule, which suggests assembly size tends to be near the cube root of the population, the current first-chamber size of 51 is already only about one third of expected. If this referendum passes, Puerto Rico will have an extremely undersized assembly. There is some tendency for islands (especially in the Caribbean) to have undersized assemblies. And the cube root rule might not apply to assemblies of not fully sovereign entities (though its underlying theory makes no such explicit claims). In any case, this would be a really small legislature for a “Commonwealth” of around 3.7 million.